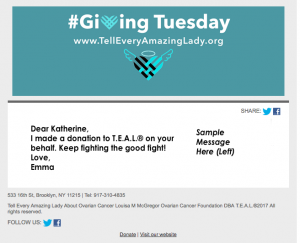 Peck’s Homemade joined forces with T.E.A.L.® this past September to spread awareness about Ovarian Cancer during National Ovarian Cancer Awareness Month by participating in the T.E.A.L.® September Awareness Campaign. 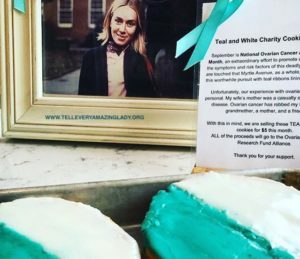 Located at 455A Myrtle Ave, Brooklyn, NY, Peck’s Homemade additionally showed support by pledging a portion of proceeds raised from an amazing special of Teal & White Cookies, a clever twist on the classic Blank & White Cookies in honor of National Ovarian Cancer Awareness Month, made exclusively during the month of September. Their collaborative effort helped spread awareness within their community as well as raised $800 to further research and awareness programs. A Special Thank You to Peck’s Homemade for their AMAZING support!